Guernsey runners to attempt 48 hour treadmill record – Philip Smith and Warren Mauger have launched their next challenge – to complete 48 hours on treadmills. The challenge will take place on the island from Friday 4 September to Sunday 6 September with a target of raising £100,000 for four charities. Philip and Warren both hope to break the world record for completing 251.79 miles in 48 hours set by Tony Mangan in 2008. 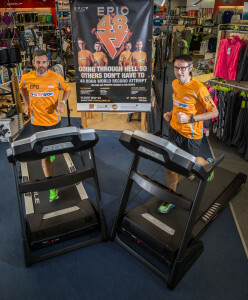 Both will be running alongside record-breaking athletes Robert Young and Adam Holland. Funds raised will go to Robert’s chosen charities (the NSPCC and Dreams Come True),This Is EPIC and The Hub. Philip is a co-founder of This Is EPIC which was set up in 2013. Last year he and Warren organised and ran 7 Marathons in 7 Days in Guernsey, which raised over £20,000. They also organised and ran the This Is EPIC Guernsey night-time marathon in December 2014. “I’m still overwhelmed by the support we received from our 7 in 7 challenge. Clearly Warren and I haven’t learnt our lesson and we are coming back for more,” said Mr Smith. Mr Mauger said: “I like to do things that scare me, it pushes me to go further than I believe I can and at the same time help to shine a light on the charities we support. If I didn’t believe my running would change people’s lives, I would not have the will power to see these grueling challenges through.